Satellite Media Tour: " Host an Organic Super Bowl Party"
The Super Bowl is coming up this weekend and did you know Americans consume more calories on Super Bowl Sunday than Thanksgiving? Why not swap that indulgence for some simple, better-for-you choices, including an organic beer? 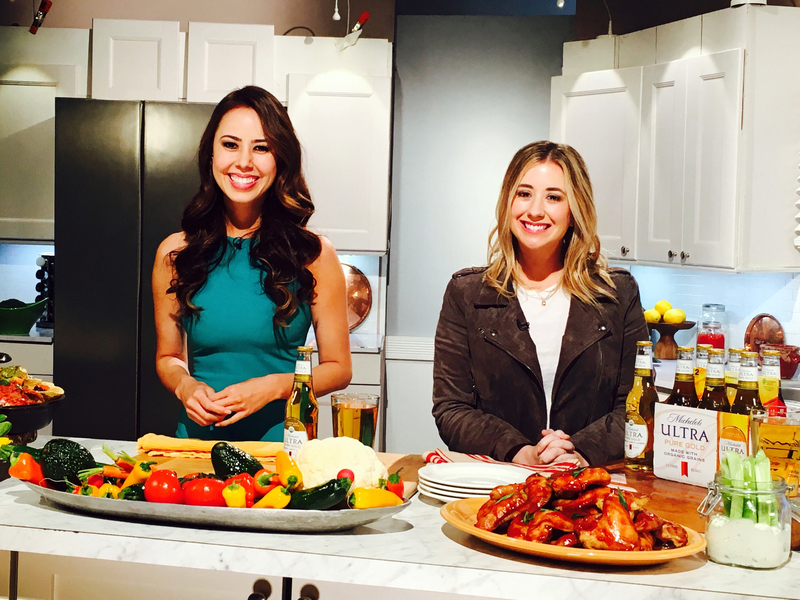 ?Michelob ULTRA Pure Gold brewmaster Chrissy Davenport and I offered an inside look at what it takes to brew a USDA certified organic beer and offered up some great organic recipes to pair with it are Michelob ULTRA Pure Gold! Watch our segment on TV affiliates across the country this week leaving up to the big game! Michelob ULTRA Pure Gold is the first major beer to be USDA certified organic and there is a lot that goes into getting the USDA seal of approval as certified organic! Michelob ULTRA Pure Gold is an organic beer made from ingredients inspired by nature such as organic grains. Beginning this month, all bottles now proudly display the USDA certified organic seal. Every farm we source our ingredients from must meet the USDA’s rigorous organic requirements, and is audited on a yearly basis, so we can ensure the malts, rice and hops that go into Pure Gold are grown naturally without pesticides or chemicals. We also create our own organic yeast to brew Pure Gold, and are the only major beer brand to tackle this feat. And that’s just talking about ingredients! Everything that Pure Gold touches – from the time the farmers grow the grains to when the cold, refreshing beer touches your lips – must also meet USDA certified organic requirements. That means every aspect of Pure Gold, from the brewing to the packaging, is USDA certified organic. Brewing an organic beer may not be easy, but it certainly is worth it. What does organic mean for the food and drinks we enjoy and how can we enjoy more of it at our Super Bowl parties this weekend? As a nutritionist, I encourage my clients to integrate organic food and beverages into their meals whenever possible. When something is organic, you can feel good about the ingredients in it and the way it’s made. But organic cannot be at the sacrifice of delicious taste – especially on a day like Super Bowl Sunday! This weekend, you can enjoy the classics – such as nachos, dips, Buffalo Wings and beer without the guilt. These exclusive Tastemade recipes are made with all organic ingredients and they are a great way to enjoy game day favorites without overdoing it. The base of our Spicy Organic Black Bean Enchilada Skillet Nachos is organic black bean chips made from scratch the we piled it high with organic veggies! For our Roasted Organic Red Pepper Buffalo Wings, we ditched the store-bought sauce and made our own with organic roasted red bell pepper blended with an array of spices to give it just enough heat. And what would a Super Bowl party be without the beer? With only 85 calories and 2.5 carbs, Michelob ULTRA Pure Gold is actually lower in calories and carbs than a glass of wine so you can have your beer without the feeling of guilt. It’s light, it’s delicious and it’s organic – just look for the seal! For the full Tastemade recipes visit YouTube.com/MichelobULTRA. You can also check out at the Michelob ULTRA Pure Gold Super Bowl commercial before it airs in the game, by going to YouTube.com/MichelobULTRA.